It’s been a year since the Washington Capitals handed out what is likely their most sought-after giveaway ever: The gravy boat that looks like an ice resurfacer. Why was it so popular? For one, it was unique. In fact, it was so unique, other teams, like the Chicago Blackhawks, got jealous and followed suit. But also, it is rare. Very few folks, relatively speaking, got one. It wasn’t a stadium giveaway. In fact, at first the only way to even get one was to buy a ticket package that featured it, which would’ve made it more rare, but after certain season ticket holders complained, Club Red 365 members got one, too. That left the rest of us gravyboatless. To eBay! The going price for the gravy boat, over the past year, has been at minimum $100. Even now, they rarely pop up there. 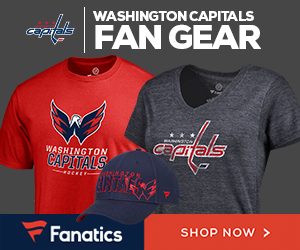 Recently, however, the Caps did offered fans the chance to get one as a prize for buying raffle tickets for the genuine Stanley Cup ring, but that too, was $100. We asked our readers for their gravy boat pics, just to check in on them. “I use it about once a month for Sunday dinners,” said reader Toni Trombecky, who now lives in Vegas. “Mine is in the box still…safe keeping,” reader Hope Pursell said. “Use it as a candy dish,” said reader Phyllis on Twitter.
.@Laughlin18 used it for gravy AND beer ???????? via @StacyBaker16, including the Kuzy figurine and Holtbeast.